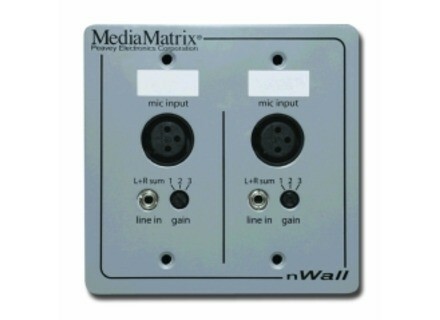 MediaMatrix nWall 2.0, Analog to Digital Converter from Peavey. Peavey introduces the new MediaMatrix nWall 2.0, a surface-mount audio interface panel that converts audio from analog to a digital stream that can be routed via CobraNet right at the panel. 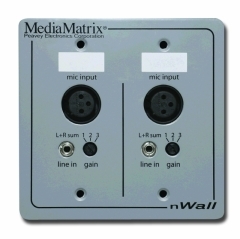 The nWall 2.0 offers analog-to-digital audio conversion and transport for MediaMatrix. By converting two balanced XLR inputs and two 1/8” inputs into a digital audio stream at the panel, the nWall 2.0 is designed to reduce buzz, hum, ground loops and other cable issues, eliminates the need for isolation and impedance matching interfaces, and replaces long analog cable runs with a single CAT5e UTP cable. The nWall 2.0 interface panel fits in a standard two-gang NEMA back box, and is powered over the attached network cable from a network PoE-capable network switch that conforms to IEEE 802.3af. The XLR connectors can be configured for multiple audio input sensitivities from -56, -26 to +4dBu, selected from a rotary switch located on the unit’s front panel. The XLR inputs support electret condenser and dynamic microphones plus line-level audio with 15V DC phantom power. The 1/8” (3.5mm) TRS mini jacks accept a nominal -8dBU signal that is summed to mono and mixed with the XLR inputs. Any number of nWall panels can be patched to any number of MediaMatrix NION processing nodes. For more information visit mediamatrix.peavey.com. Optimize Your Reverberant Space for the Best Possible Sound There's nothing like the sound of real reverb, such as what you hear in a cathedral or symphonic hall. That's because reverb is made up of a virtually infinite number of waves bouncing around within a space, with ever-changing decay times and frequency responses. For a digital reverb to synthesize this level of complexity is a daunting task, but the quality and realism of digital reverb continues to improve. Moog MF-108M Cluster Flux The Moogerfooger MF-108M Cluster Flux is an analog BBD based chorus flanger with Tap Tempo modulation for guitar players, and MIDI control for keyboardists, recording, etc. Cerwin Vega XD3 Cerwin-Vega announces the new XD3 Powered Desktop Speaker.